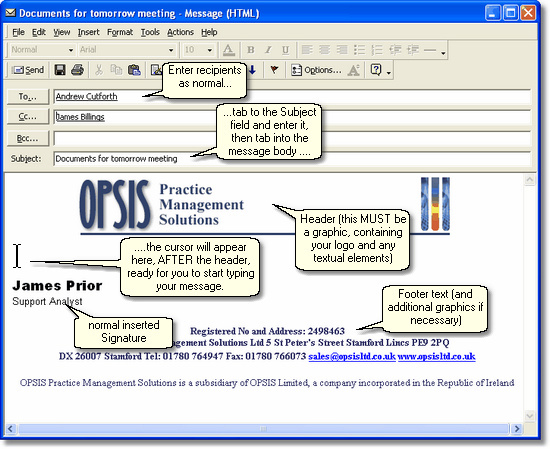 Many businesses want to present the right image when contacting their customers by email, and the possibility for Microsoft Outlook ® (whether Outlook 2000, 2002 or 2003) and Microsoft Outlook Express ® to send either Rich Text or HTML format e-mail messages are becoming more popular than using basic Text format. Microsoft Outlook ® allows the use of Outlook Email Stationery and Outlook Signatures to create a personalised "look" for emails, however often these can have a rather basic and even "twee" appearance, and in their basic form are not particularly suitable for corporate use. Often businesses may want to make their emails appear like their corporate headed letter paper, including logo etc, at the head of the email. Unfortunately the basic Outlook Stationery templates do not allow for headers. At least not without a little work! Templates do not allow Headers to be created in the standard Outlook Stationery Picker template designer - it is a very simple tool, offering very basic functions only. ...unfortunately Background graphics get repeated all the way down the page, just making the message look a mess. It's fine if the background is the kind of graphic designed to tile and cover the rear of the message, but for a corporate logo which we want to act as a header graphic it just doesn't work - unless we can do something clever! Signatures can be set up and used to provide a personal sign-off and contact details, but they are designed to add information at the tail end of the email. You could add your text and logo for a header into a Signature, but you would find that every time you write an email you would have to re-position your cursor after the header before starting to type the main body of your email message. For business use, having to remember to reposition your cursor every time before typing in each and every email would be tiresome. You just want to Tab into the body of the message after entering the Recipient and Subject, and get typing! So how do we achieve it? Simple - for the full answer just download my free PDF Format document which explains all the above issues, complete with screenshots, and then describes how you can setup and modify Outlook Express, 2000, 2002 or 2003 Email Stationery Templates to work with a corporate heading, signature and footer. Click below to download - no catch, just a quick simple download!